Moon Hyung-pyo bows his head after being appointed as the new health minister by President Park Geun-hye. President Park Geun-hye pressed ahead with her controversial appointment of senior officials Monday despite strong objection from opposition parties. Park formally appointed Hwang Chan-hyon as chief of the Board of Audit and Inspection, Moon Hyung-pyo as minister of health and welfare and Kim Jin-tae as new prosecutor general Monday. The move came hours after the leaders of the two main parties met in an unsuccessful bid to find common ground to resolve a political stalemate that includes an opposition boycott of the National Assembly. 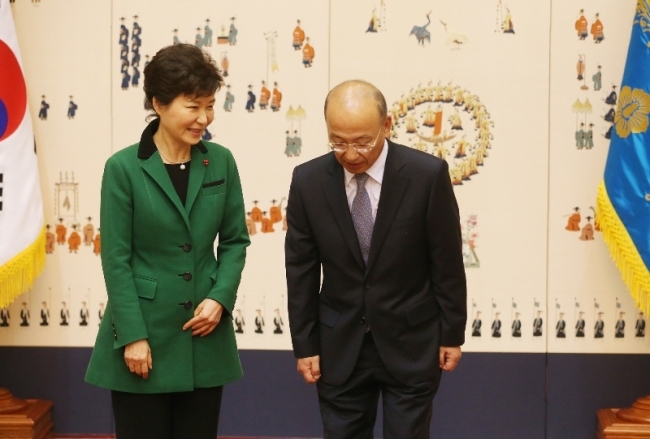 Park’s move is likely to add to existing political tension. The Democratic Party has opposed Moon’s selection especially, citing irregularities in his use of a corporate credit card while working at the state think-tank the Korea Development Institute. “Our reaction cannot but go beyond disappointment to rage. This is clearly an action by President Park Geun-hye that disregards the National Assembly,” DP floor spokesman Rep. Park Soo-hyun said. The DP has dug its heels in, linking Moon’s appointment with that of Hwang, and saying that it would only approve Hwang if the former resigned. But the ruling Saenuri Party, which holds 155 of the 300 parliamentary seats, processed Hwang’s appointment Thursday, inciting fierce criticism and threats of legal action from the DP. The development led to a DP boycott of parliamentary processes starting Friday. The move, which Kim Han-gil has declared that he will see to its end, with his chairmanship on the line, has raised concerns about the pasing of the national budget for next year. In response, the Saenuri Party had planned to put the budget up for review unilaterally until the four-way meeting was agreed to. The meeting was attended by Saenuri chairman Rep. Hwang Woo-yea and his DP counterpart Rep. Kim Han-gil met along with their floor leaders, Reps. Choi Kyung-hwan and Jun Byung-hun. “As the people want the regular session of the National Assembly to have good results, the ruling and opposition parties will try to reach an agreement,” Hwang said. Kim, however, took a more aggressive approach, opening with an attack on the Saenuri Party. “Politics has disappeared. As it is, the future of the country cannot be considered,” Kim said. He went on to repeat the reason he suggested holding a four-member conference on Nov. 25, accusing the ruling party of ignoring his attempt to normalize Assembly operations. According to Kim’s suggestion, the inter-party conference would focus on issues surrounding the launch of a special counsel investigation into alleged election meddling by state agencies and a special parliamentary committee on reforming the National Intelligence Service. The meeting, however, produced no results apart from the two sides scheduling another meeting for Tuesday. As the two sides attempted to find middle ground, the DP continued its protest over the approval of Hwang Chan-hyon’s nomination. On Monday the DP submitted a resolution calling for National Assembly speaker Rep. Kang Chang-hee’s resignation. After Hwang Chan-hyon’s nomination was approved, the DP attacked Kang, saying that he violated the National Assembly Act in denying the opposition’s right to filibuster the motion. In addition, DP lawmakers claim that Kang violated their right to vote by declaring the vote complete when they had made it clear that they intended to cast their ballots.